Once your puppy has successfully completed the basic Puppy School puppy training, the sky’s the limit as far as further training is concerned. There are many excellent ‘dog sports’ which you can now take part in. NB Although training can begin straight away, puppies will not be able to start jumping until they are 18 months old when they have finished growing as, otherwise, this can damage their growing bones and joints.. Dogs are taught "moves" by their handlers which are then linked together and choreographed to interpret their chosen music. Routines are assessed for "Programme Content", "Accuracy and Execution" and finally "Musical Interpretation"
If you have a gundog breed, you might be interested in exploring gundog work as an activity to get involved in. This doesn’t have to involve shooting or dispatching game, if you find that distasteful. The gundog breeds are divided into retrievers, spaniels, pointers and setters and “hunt, point and retrieve” breeds (HPRs). Each of these subcategories functions in a different way and fulfills a different role as a gundog, so it’s worth investigating what the role of your breed should be, in the field, because this will have a big impact on the training. 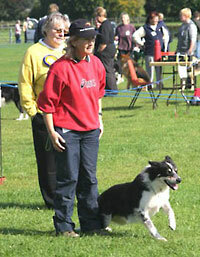 There are many books on the roles of the breeds and a lot of information online. If you are not sure about the idea of game being shot around you, you probably want to start off with “gundog working tests”. 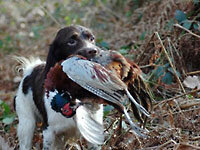 These are held in the summer months and organised by various gundog clubs. They are a series of tests, usually about 4 or 5 separate tests, which are identical for each dog and they are based around retrieving canvas dummies and obedience. No game is shot. 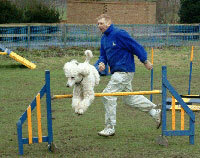 There are separate working tests for retrievers, spaniels and HPRs. These are competitive, with placing results, but they are also informal and friendly. If you are the non-competitive type, shoots all over the country are always looking for more beaters, especially those with dogs. (Beaters are the people who make lots of noise and scare the birds up.) The type of dogs which are best suited to beating are spaniels, but other breeds are used - some people even beat with terriers, collies and GSDs! It’s a good idea to make sure your dog has an excellent recall before you take it on a shoot - or keep it on a lead, walking with you. If you own a giant breed such as the Newfoundland, you might consider using their natural tendency towards water in a positive way by becoming involved in water work. Since the late 1980s there has been an increasing interest in this sport.